April 14, 2012 by Alphageek in "alphageek", "review", "urbanspoon"
3/31/2012 The weekend of trying new restaurants continued, as we sought out somewhere to get seafood. There were only two conditions that the restaurant needed to meet. The restaurant needed to get good online reviews, and it had to be within walking distance of our hotel. 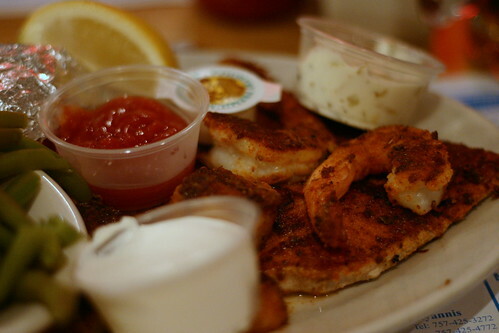 After some research, we settled on Nick's Fresh Seafood & Steaks, and we are glad we did. This is a cozy, friendly restaurant where many of the patrons know each other and the staff, giving it a warm and inviting atmosphere. We took a seat in the crowded restaurant. There were plenty of folks there who seemed to be having a great time. We took a look over the menu, and made our choices.They also seem to get some fresh fish, and the fresh fish is listed on the chalkboard on the wall, in a straightforward, unpretentious manner. We started with some chowder. It had some corn, potatoes, parsley, green onions, bacon, and of course clams in a mild broth. We added a little salt and pepper, and enjoyed a small little treat before the main meals arrived. I ordered the Blackened and Broiled platter, which you can see in my picture below. The dish included shrimp, scallops and tuna, which were all seasoned with a generous portion of spicy seasoning. The shrimp and the scallops were not at all overcooked, making this a great dish. There is a word of warning to the tuna snobs out there: this tuna steak is thin, and cooked all the way through. Don't order this dish and expect to get the seared on each side preparation. The alphageek likes tuna steaks all sorts of ways, but you may not, and you have been warned. See those green beans peeking out on the side of the picture? They were not your canned green beans so common in restaurants. The alphageek likes touches like that. Mrs. alphageek ordered the Seafood Medley. 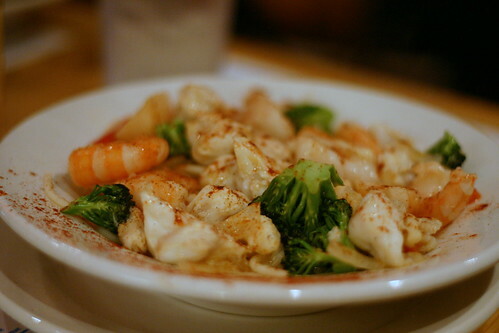 This is a pasta dish that is generously finished with lumps of crab meat, shrimp and scallops. I tried a bite or two, and found it to be an excellent dish as well. There was an excellent ratio of seafood to pasta. They certainly do not overload this dish with pasta, but instead give generous portions of seafood and use the pasta as an additional accent. This dish also came with a large salad. While the salad was not fancy, it was served fresh, and cold, which makes it a great start to the meal. Yet again, some research yielded some great results. While not the fancy dining experience some people may crave while on vacation, Nick's does provide a great meal. The large number of friendly folks there are all the statement that Nick's needs.